How does Trump White House turnover compare with Bush, Obama? 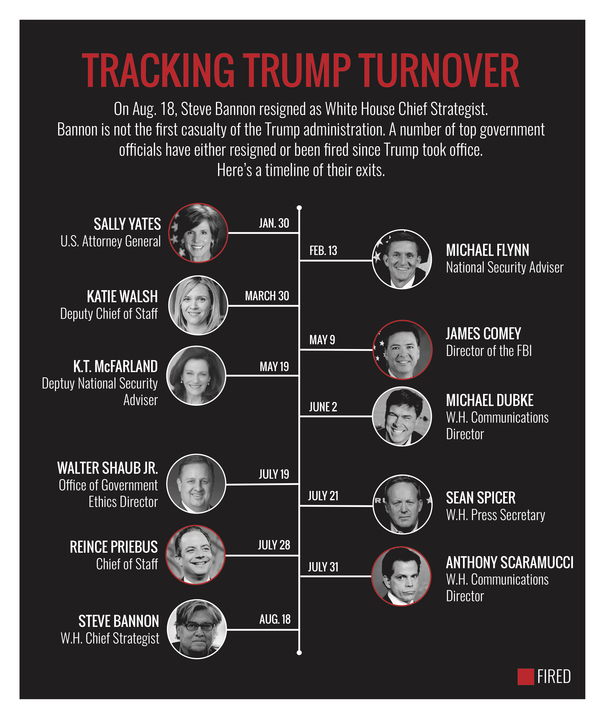 By Manuela Tobias on Friday, August 4th, 2017 at 1:51 p.m.
A timeline of the resignations and firings of top government officials during President Donald Trump's administration. President Donald Trump called July 31 a "great day" at the White House. The characterization clashed with news headlines of internal upheaval: July 31 was the 10th and final day of Anthony Scaramucci’s tenure as communications director and John Kelly’s first day as chief of staff after the forced departure of Reince Priebus. In the past six months, the Trump administration has seen the firing or resignation of its chief of staff, communications director, press secretary, FBI director, ethics director, national security adviser and more. Pundits and members of the media have remarked on the "chaotic" turnover. But is the Trump turnover as rapid as it seems? We compared the length of service of the most high-profile departed Trump staffers with people in the same role in the administrations of President Barack Obama and President George W Bush. In context, the speed of Trump’s hires and fires have been surprising, but not unprecedented across the board. Priebus was in fact the shortest-serving chief of staff in history. He served for 189 days, while the second-shortest stint (Kenneth Duberstein under Ronald Reagan) lasted 203 days. Pete Rouse served for only 104 days as interim chief of staff for Obama in 2010 after his first chief of staff, Rahm Emanuel, left to run for Chicago mayor. But Priebus wasn’t in an interim role. The communications director is the newest role on this list, created in 1969 by the Nixon administration. The first director was Herbert Klein, who lasted the longest in office. He was tasked with dealing with the Watergate scandal that eventually led to Nixon’s resignation. Trump has gone through three communications directors so far, with Scaramucci serving the shortest period as the second person named to the role. His 10 days as communications director (he was not officially supposed to start until Aug. 15th) almost beat out Jack Koehler for shortest tenure. Koehler worked in the Ronald Reagan administration and stepped down after a week on the job, when news broke that he once belonged to a Nazi youth group. Trump’s first communications director was Republican operative Michael Dubke. He was on the job for 134 days. Press Secretary Sean Spicer took on his responsibilities for 53 days until Scaramucci came along, at which point he resigned. There have been other brief tenures in the position in the recent past. Ellen Moran served for 92 days at the start of the Obama administration, after which she became chief of staff for Commerce Secretary Gary Locke. George Stephanopoulos, under the Clinton administration, served for 138 days. George W. Bush’s first communications director, Karen Hughes, lasted just over eight months. Spicer, Trump’s first press secretary, lasted 182 days. There have been shorter tenures. Jerald Franklin terHorst was in office for one month at the start of Gerald Ford’s presidency and acting press secretary Stephen Early served for 13 days under President Harry Truman. In more recent history, Bush’s first press secretary, Ari Fleischer, lasted over two and a half years. Obama’s Robert Gibbs worked in the role just over two years. Michael Flynn set another record for shortest tenure as national security adviser, a position established in 1953 amid the Cold War. Flynn was on the job for 24 days before he resigned (Feb. 13); the average is 2.6 years, according to the Washington Post. Flynn acknowledged in his resignation that he misled Vice President Mike Pence and others about illegal conversations with a Russian official. Condoleezza Rice lasted 1465 days, or four years and four days, as Bush’s first national security adviser and James Jones lasted 993 days, or two years and eight months, under Obama. Former FBI director James Comey wasn’t the shortest-serving FBI director in history, but his tenure is on the shorter end at three years and eight months. He is the second FBI director ever to be fired. The last and only other time this happened was when Clinton fired William Sessions after he refused to step down amid ethical concerns in 1993. Update: An earlier version of this report incorrectly said Nixon had been impeached. The House Judiciary Committee approved three articles of impeachment in 1974 but he resigned before there was a trial. An earlier version of this story also named Stephen Hadley as Bush’s first national security adviser and Thomas Donilon as Obama’s; they were each the second, not first, national security advisers to their respective administrations.